So I am browsing the Gear Page Amp Emporium (always a dangerous thing for me to do) and I run across this beautiful creme tolex Kingsley Deluxe 32 head w/matching Swanson 2x12 cabinet. Naturally I jumped right on it and did the deal. I basically traded my Carol Ann head for the D32 head and Swanson cabinet, minus the speakers. I can report that she sings beautifully! Much thicker, fatter and ballsier tone than my Kingsley ToneBaron right out of the box (but I suspect the same tones live within the ToneBaron... it's just a matter of dialing them in). I also think the Swanson cabinet is tuned for more pronounced mids. I am using the exact same speaker pair with the D32 that I use with the ToneBaron, which are Eminence designed Two Rock TR 65-16 12" speakers. This amp has the same beautiful, hand-build construction as the ToneBaron and is actually a precursor to the ToneBaron model. It runs four EL84 power tubes, five 12ax7 preamp tubes, is tube rectified and cathode biased. 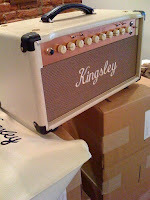 The previous owner sent this amp back to Kingsley creator, Simon Jarrett, for Powerscaling and PPIMV (Post Phase Inverter Master Volume) mods. The D32 is a two channel amp with Reverb available on the clean channel only. This particular amp comes with footswitchable boost for both channels, and in true Kingsley style the footswitch includes volume pots to adjust the boost amount right from the pedal! No need to run back to the amp to make adjustments. Look for a full review of this amp soon.